July | 2013 | I have to write something EVERYDAY?! These are no ideal circumstances in which to communicate, but it’s only for a few days, so I don’t mind. Last night I got done with work pretty late, ate dinner, and then headed upstairs to watch a TV show that has been pre-screened to be devoid of: people dying on airplanes, intruders breaking into houses, anything remotely serious or sad. I needed to take a shower, but I didn’t want to take a shower alone at nighttime. The sound of the water beating on the tub would drown out the sound of anyone trying to burglarize my home and prevent me from taking decisive action. After a while, Jack texted me saying “I’m waiting for my food. I love you!” and I texted back “I’m watching TV and will go to in about an hour. I love you!” Then I went to sleep. This morning I woke up and went to work with oily hair. During my time at work, Jack texted me saying that his presentation went well and that he might have a chance to call me during lunch. I left Sylvan, full of hope that I would get to speak to my beloved. I figured that he would call while I was at the grocery store, but didn’t see that as a problem. I knew I could take my cart to the paper towel aisle and hang out there and chat. No call. So, I got home and unloaded the groceries. Then I made lunch. Then I baked a cake. By this time it was about 2:30, so I was pretty sure that Jack just hadn’t been able to get away and felt comfortable taking the shower that was, by now, long overdue. Just as a precaution, I left my phone on the vanity in case he called. I’ll give him credit for his timing: Jack waited until the water had warmed up, I had gotten completely soaked and the maximum amount of shampoo/soap was on my body before he called. I didn’t want to miss talking to him, so I hopped out, dried off my right ear and my right pointer finger and took the call. It was great hearing the sound of his voice. I finished this book last week and meant to write about it LAST Friday, but things kept coming up (“A stranger mistakes the man I share a bed with for my brother” couldn’t go unwritten) But, I’m finally ready to review this book. 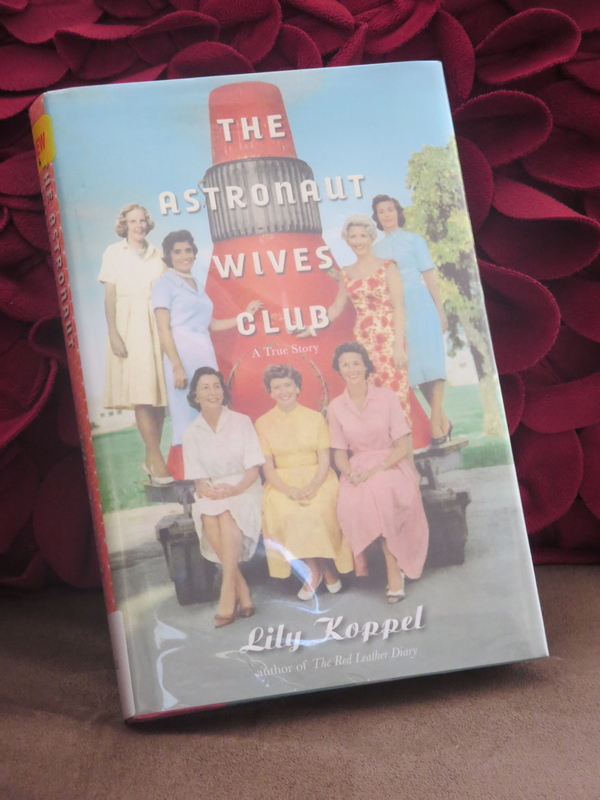 Lily Koppel masterfully weaves the stories of many women, each of whom has a different perspective on NASA, into a compelling portrait of what life was like during the space race. As someone who was an undeveloped ovum during this time in our nation’s history, it was especially interesting. Koppel introduces the book by profiling each of the wives of the “Mercury Seven” as they got the news that their husbands would travel via high-tech-tin-can into the stratosphere, which may or may not be fatal. She goes on to chronicle the ups and downs of the NASA program through the eyes of bright women who may have been made out to the media as copies of the same “perfect housewife” mold, but in actuality couldn’t be more different. Koppel should be praised for her engaging writing style that gives an intimate look into these families’ lives without seeming trashy. Our (the whole Stolle family’s) cat passed away yesterday. She was ready to go and died gently in a familiar place with her family comforting her. While we were waiting, I started remembering her out loud: what she was like before she became so ill. Milkshakes found perches wherever she was. 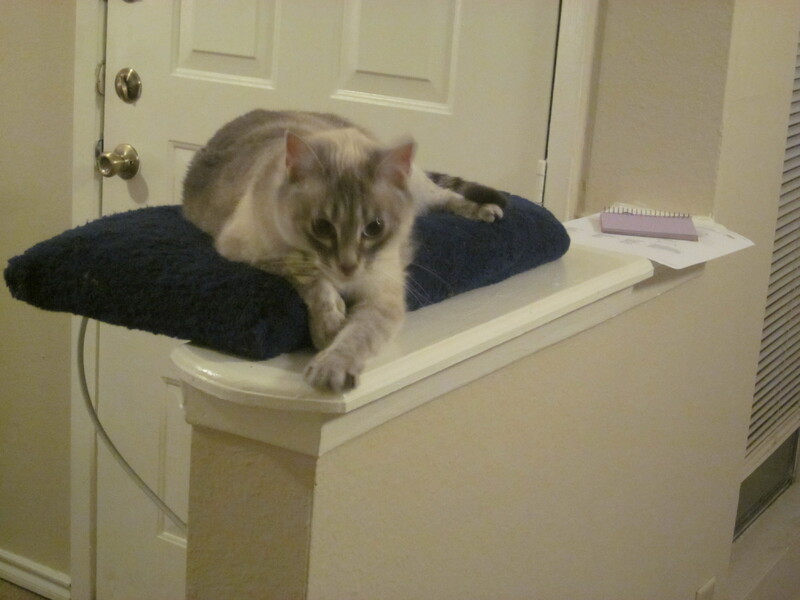 Eventually my MIL and I just indulged her and built interesting perches for her. 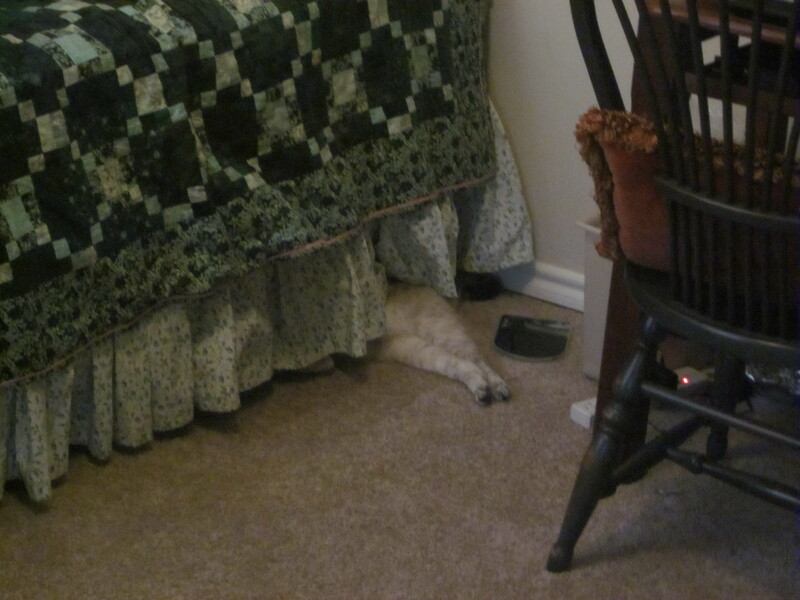 This was her favorite spot in our apartment because she could see the study, the living room, the dining room, and the kitchen. She loved the basket that my MIL built for her in the warm laundry room of their house. This picture doesn’t have a memory story attached to it, but I thought it looked silly and sometimes you need to remember the frivolous things, too. Milkshakes loved being around us. All we’d have to do is sit somewhere for a few minutes and she would slink up and find a spot near us to observe. When we’d all gather at my in-laws house and watch a movie, Milkshakes would sit in the dog bed and watch us watching the movie. 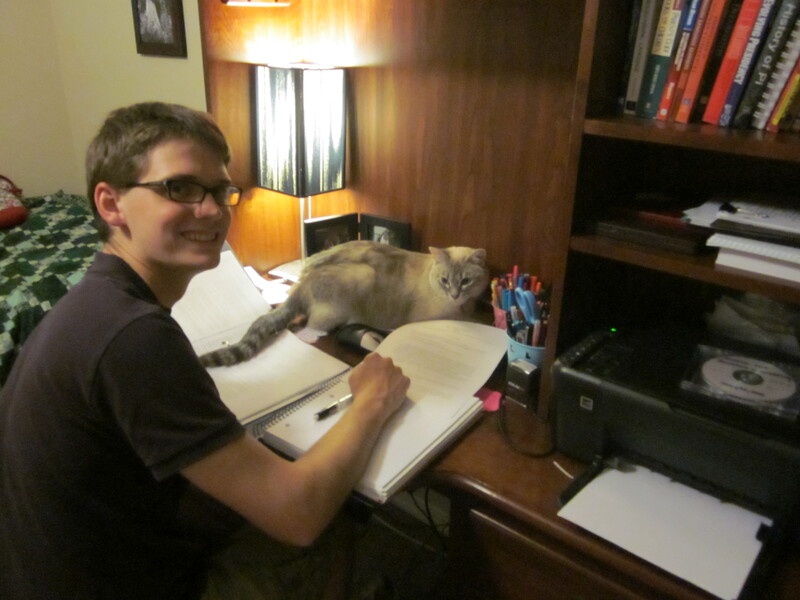 She loved getting in the way of our studying too. Jack had a great picture of her on his old cell phone. He had gotten up from the table to get a glass of water and when he came back, there was Milkshakes. Laying on the keyboard of his laptop. Asleep. We also had a picture of her sitting in Jack’s chair at the dining room table with all our art history textbooks out. Her little head was just peeking over the table. It looked like she was reading. 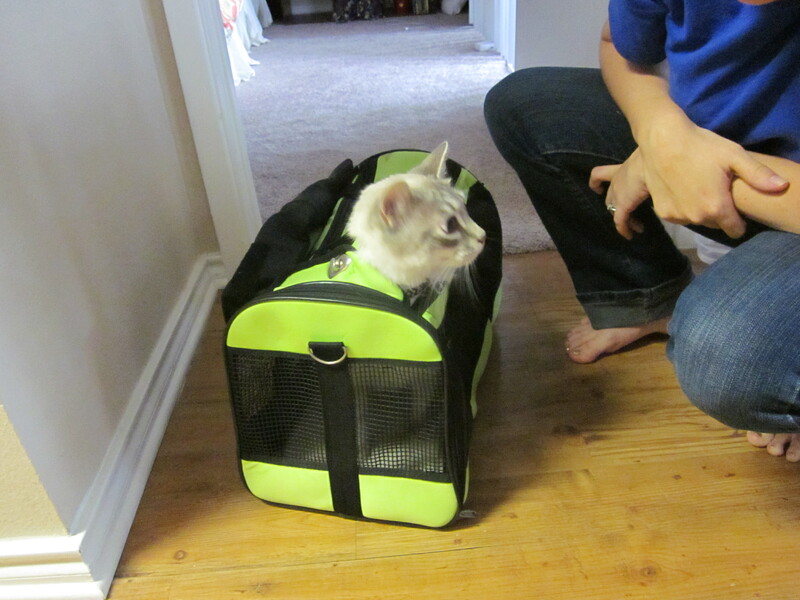 Milkshakes didn’t like the cat carrier and she was very good and wriggling out of it. Eventually, we had to not only zip and snap all the openings on her carrier, but then use twist-ties to secure all the zips and snaps. 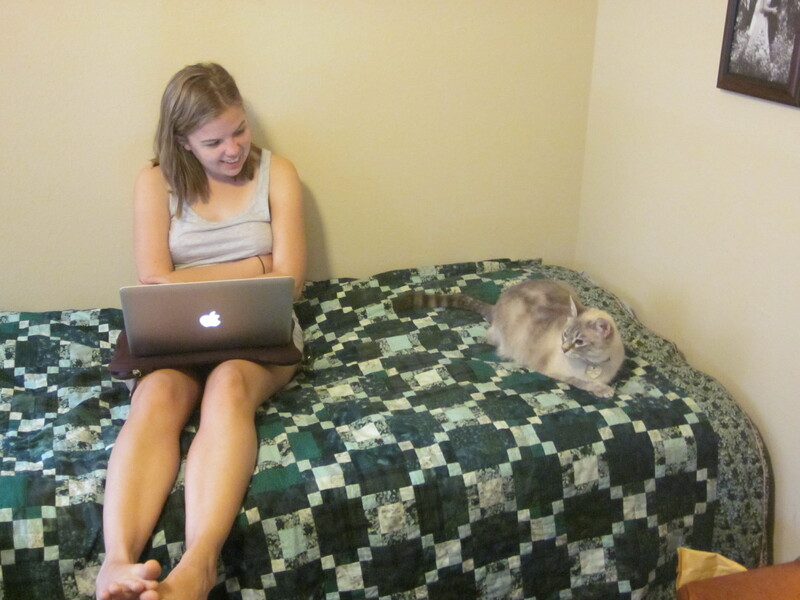 This was one of our failed attempts to get her to her house pre-twist-tie. Milkshakes loved to play. We had a bunch of crinkly paper that was used to pack dishes after our wedding. Milkshakes came to visit and took to that paper like a fish to water. She would just walk in a small circle listening to the gentle crinkle crinkle crinkle. She also loved the little toy she’s holding in the picture. 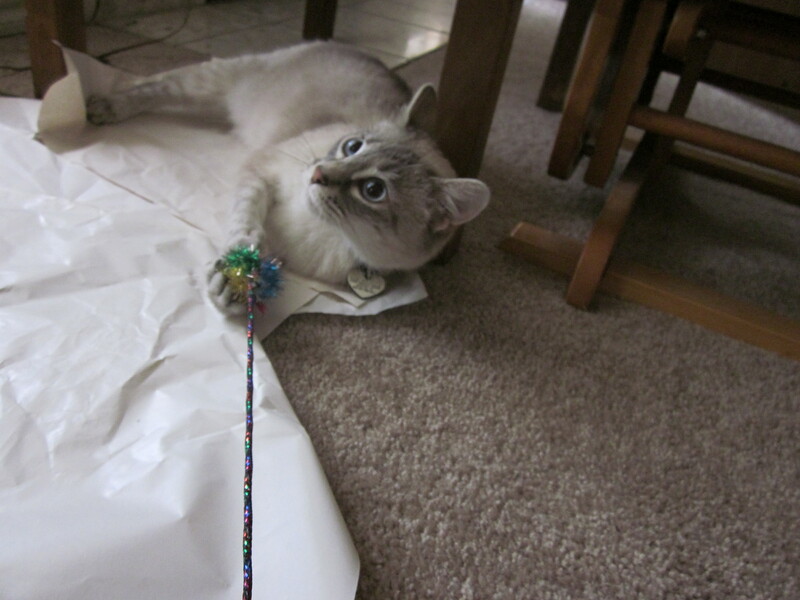 There was a small wand with a colorful,elastic rope and a fuzzy ball attached. We would sometimes play with her, but other times we would just set the wand in some nook and let the rope and ball dangle. She liked that just as much. We have lots of funny memories from her illness as well, but we didn’t talk about those yesterday. Jack and I said a little prayer for her when we knew that the time was coming. We prayed that she would just peacefully fall asleep and never be sick again. It was answered 20 seconds later. Today a nice man from Cutco came to sharpen my knives. For my wedding, my great-aunt Adele gave me $100 to buy a nice knife. Apparently, the people at Cutco keep track of that sort of thing and after 3 years give you a little phone call and arrange an appointment to come sharpen your knives. I got a call yesterday and scheduled an appointment for today to come at 10. Jack had some work to do on the computer, so he was working at home when the man came. We invited him in and I helped him get his things set up. I told him that we got the knives as a wedding present. After he sharpened the knives, he asked if there was anyone that I knew of that would like a presentation. I told him that I didn’t know of any one. I mentioned that my mother-in-law liked Cutco knives but that she had all she needed. Do you want to show your brother? I laughed a bit. I mean, does he think that my brother and I have purchased a house together? Does he not remember the reason I have Cutco knives? Does he not remember who I mentioned loves Cutco knives? Does he not see the sparkler on my finger? His eyes bulged out, hopefully from embarrassment and not from disbelief and said, “Oh, but you look so young.” I told him that we had been married for over three years; that Jack was getting his PhD and that I’d taught elementary school for the past few years. Then I sat down and listened to him limp through the rest of the presentation. He mentioned at the beginning of the presentation that he was 34 and he mentioned a girlfriend, so I know he isn’t married. Just think, when I’m his age, I’ll have been married 13 years! Tuna Helper was a boxed dinner, yes. It was easy to make, yes. But best of all, the meat was tuna. Unlike steak or chicken, I could keep tuna in my cabinet for months. 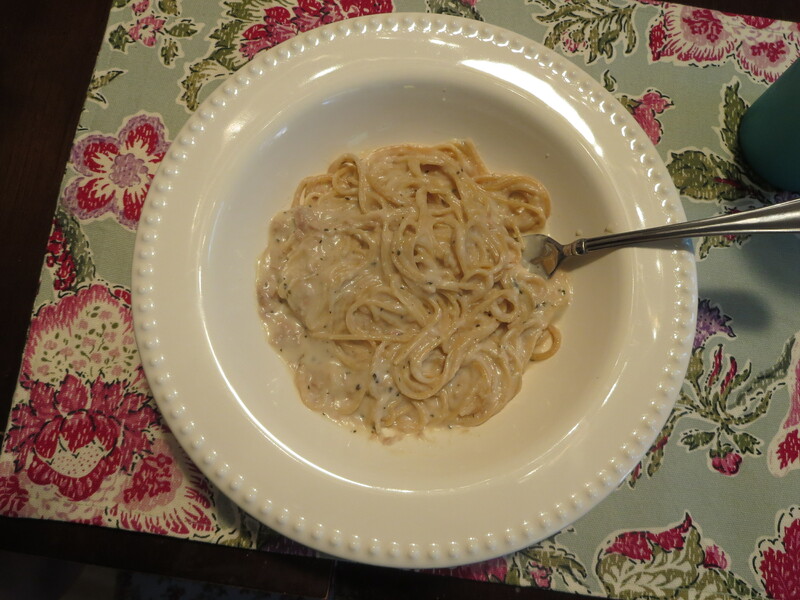 So, if I had run out of things to make or was tired, I could just whip up some Tuna Helper and we’d have a meal. As I got more adept at cooking, I stopped buying many boxed meals. I felt comfortable making interesting dishes like “Curry Potatoes with Lentils” and “Asian Broccoli Pasta.” They were so much more healthy than the boxed dinners and I could control what was put into them. But, I still kept that Tuna Helper in the cabinet just in case. I mixed those ingredients in a sauce pan while my noodles cooked and voila! Super Tuna Helper! Much cheaper, much healthier, and much more satisfying. Over my vacation, I read “Facing Down Evil” by Cliff Van Zandt. He was an FBI hostage negotiator during the seventies and eighties and had many interesting stories to tell. I really liked that the book is thrilling without being violent. You’re rooting for Van Zandt and are therefore rooting for an as-peaceful-as-possible resolution to whatever crisis is playing out in the story. It’s also great that these are all true stories, and many of them are recognizable. This guy negotiated for the FBI during the Branch Davidian debacle as well as having an active role in the capture of the Unabomber. If hostage negotiation interests you, start by reading “Stalling for Time” by Gary Noesner. 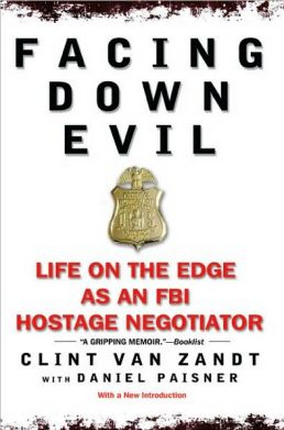 He was also an FBI hostage negotiator and his book is definitely a four-heart quality book. Interestingly, Noesner is mentioned briefly in “Facing Down Evil.” Van Zandt paints him as a little, annoying tattle-tale. If “Stalling for Time” makes you ache for more adventure, “Facing Down Evil” is a good consolation prize. I only post things when I have things to share and the time to share it. And that usually means that I post about three times a week in the summer and once a week during the school year. Well, I had 2 things to share today and plenty of time to do it. 1. to answer us. We get to have a relationship with Him. We aren’t sending out messages in a bottle, or even prayers up to a vague notion and hoping that they’ll arrive. He will answer us. He’s already answered me! 2.to be with us in trouble. This is one of the most amazing things about being a Christian. God sent His son Jesus to live among us and go through the whole range of human experience. When we call out to Him, He knows exactly what it feels like. Jesus was wronged countless times. So, when I say, “I feel awful,” He says, “I know, Andrea.” He also knows how to be there without demanding. God was totally fine with “Help!” for the first few days. He didn’t try to spring anything on me before I was ready. 3.to rescue us. This doesn’t mean that the person we are upset will immediately be filled with holes like Swiss cheese and we’ll be prancing around in the sunshine. He’s rescuing us from the stranglehold that Satan tries to get us in when something bad happens. God sweeps us up into His arm and lets us recover there. 4.to honor us. Again, this has very little to do with the outside world and all to do with our hearts. We won’t necessarily be honored with the things that the earthly realm has to offer. But we will be honored in His Kingdom when we enter it, and he will make clear to all of His children how precious they are to Him no matter what.